FANBOY PLANET.com . : 2015-comic-con-comics-Doctor-Who :. I'm not one to go after exclusive variant covers, which has become a cash cow thing for publishers at Comic-Con. And yet looking over my Comic-Con 2015 purchases, it does appear that I have picked up a couple. I guess I'm nothing if not consistent in my inconsistency. Which is sort of fitting for Doctor Who, isn't it? This book got my attention because it's an exclusive story - though no doubt, eventually it will be collected somewhere becuase you simply can't let work this clever for an IP this big to just sort of hide away in San Diego. 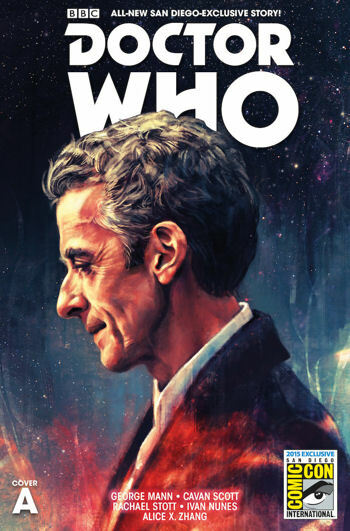 Appropriately, it's a story about the 12th Doctor visiting Comic-Con, the same summer that the actual 12th Doctor, Peter Capaldi, made his first Comic-Con appearance. Written by George Mann and Cavan Scott, it sets up a pretty good "monster of the issue" and is neatly done in one, a short story that captures the characters from the series and a bit of the lovely madness that is Comic-Con International. Is there irony that the story is also called "Selfie," featuring Clara but also sharing the title of Karen Gillan's cancelled ABC sitcom? If not, it's certainly fitting in a timey-wimey, wibbly-wobbly sort of way. Clara has always wanted to go to Comic-Con, and the indulgent but cranky stepfather that seems to be the 12th Doctor obliges -- and, of course, without being meta-fictional, the TARDIS doesn't seem to distract anyone on the convention floor. But what gets distracting for the Doctor is that Clara immediately takes a selfie, and a third entity appears in the photo. Mann and Scott take a grumbling from the 11th Doctor and run with it into a full story, that maybe our constant documentation of ourselves might reach beyond into something far darker. A malevolent entity needs our cameras to pull itself back into this reality. It definitely fits within the Moffatt era, and the writers have captured the voices of the characters well. (Mann has also written the War Doctor novel, Engines of War and was just announced as writing a new 8th Doctor series for Titan.) And the art team of Rachael Stott and Ivan Nunes keep the storytelling light and a little cartoonish while still being recognizable portraying the Doctor and Clara. Look for whichever trade paperback collects this fun story, or perhaps your local retailer bought a few copies for Doctor Who fans.